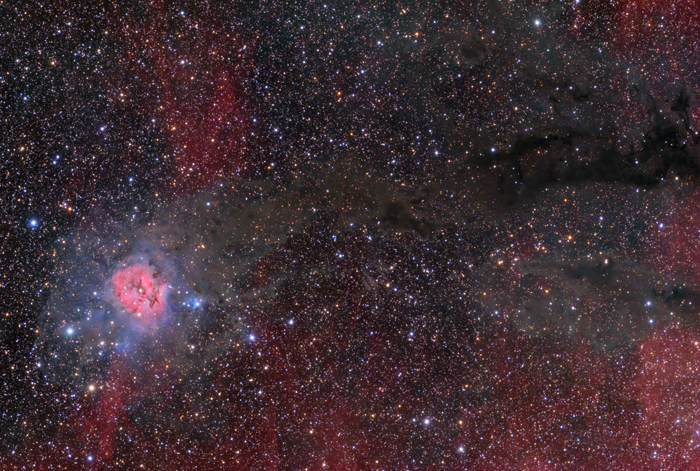 The cocoon nebula is a compact star forming region with nearly 15 light-years in diameter. Located about 4000 light-years away, the center of the cocoon nebula is glowing in red by the excited hydrogen gas. The star in the center of the nebula is likely only a few hundred thousand years old, powering the nebula glow. 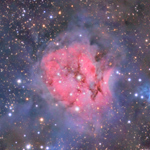 At the same time, a blue reflection nebula and dark absorbtion nebulas are visible, resulting in different color mixtures. 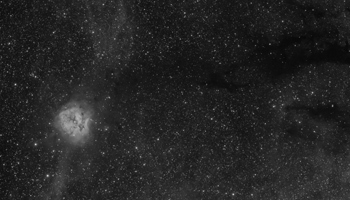 Click on the left image below to see a 150% resolution crop of the cocoon nebula. 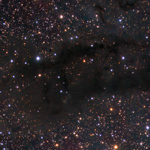 For a 100% resolution crop of LDN 1035 and other dark nebulas click on the right thumbnail.